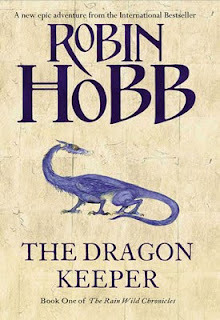 I've always enjoyed Robin Hobb's fantasy - her well-developed characters, signature bittersweet endings, and almost gritty consequences have always made her new books must reads for me. So, it is with disappointment that I must state: The Dragon Keeper fails to live up to her previous superb novels. First off, it's the length. Although weighing in at a relatively lengthy 553 pages, the large typeface makes for a plot half the size of her usual fare - the Farseer, Tawny Man and Liveship Trader trilogies all contain far more self-contained plots, containing at least some conclusion. Dragon Keeper, by contrast, simply - stops. The plot, likewise, portrayed at least an initial simplicity compared with Hobb's previous fare. The sea serpents, finally hatched after their perilous migration, have become enfeebled, flightless dragons. Tintaglia, abandoning them with her mate, seeks instead to mother a new race of dragons herself - but the Traders' Councils are bound by their agreement to care for the flightless creatures, and as game begins to grow sparse, the enfeebled creatures are abandoned, with only a few hunters to provide them with food. The dragons, meanwhile, dream of another Elderling city somewhere upriver - Kelsingra, where Elderlings and dragons once drank from a river of pure Skill. And thus, they begin to spin what seems a familiar tale to those humans who may hear them: Elderling treasure ripe for the taking. And thus, to move the dragons to an area of self sufficiency, and to establish a Trader foothold in the "Elderling treasury", the Councils recruit "dragon keepers", to care for the beasts on the arduous trek upriver. One such is Thymara, born with abnormally draconian growths - even for the Rain Wilds. Alise journeys with them as a scholar of everything draconian, freeing herself in the process from Hest, her uncaring (and otherwise brutal) husband. And once the journey begins - late into the book -, there is no progress from this situation. The book simply - ends. Nevertheless, there is much of Hobb's usual flair to admire in this. Her characterisations are perfect, and superbly portray the boiling pot of cultures after the events of the Liveship Traders sequence. Likewise, we're able to examine the cities of the Rain Wilds in far greater detail, which Hobb has only before explored in a small section of the Liveship Traders; and a short story - Homecoming (Legends II). And Hobb has, as always, an entracing style, and her way of portraying the emotions, thoughs, and agendas of the characters - even if antagonists, which is someing many authors fail at. My conclusion: Worth reading, but slightly inferior in plot and conclusion to the usual Hobb fare. Hey, this looks pretty good! I have heard great things on this series as well. I have received referals to it and as I have not read it yet I do hope to get to it at some point. Well, it's generally a great series! I'd certainly recommend the Farseer trilogy (Assassin's Apprentice, Royal Assassin, Assassin's Quest), but The Dragon Keeper isn't quite so good. :) I'd still read it, though - it's just not the best impression of Hobb's flair!